Even creatures in the deepest parts of the ocean are eating plastic. In fact, the deeper you go, the worse it gets, a new study finds. And those little critters make it all the way back up the food chain. 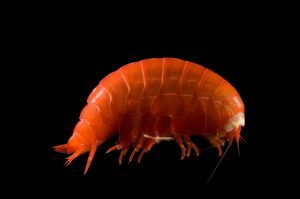 A team of researchers from England’s Newcastle University sent vehicles into six of the deepest trenches in the ocean to collect amphipods — tiny crustaceans related to crabs and shrimp. Of the 90 animals they collected, 72 percent had plastic fibers in their stomachs. In the deepest trench, all of the specimens had plastic in their guts. The 6.8-mile-deep Mariana Trench is the lowest point in any ocean. “It builds upon a growing body of evidence suggesting that the deep sea, by far the largest habitat on the planet, may very well be the largest reservoir of plastic waste on the planet,” Anela Choy from the University of California at San Diego told The Atlantic. “What you put in the trench stays in the trench,” said lead author of the study and marine biologist Alan Jamieson. Of course, Jamieson is referring to clean-up efforts. As humanity has recently learned, it’s hard enough trying to clean up plastic floating on the surface of the ocean. It would be virtually impossible to try to collect all of the microscopic plastic debris on the ocean floor. But the plastic will resurface in another, more depressing way, Jamieson assures us. 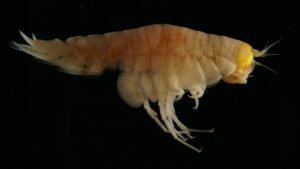 “And when the fish die, they get consumed by amphipods, and it goes round and round in circles,” with more and more microplastic accumulating in the tissue of seafood and humans as time goes on. 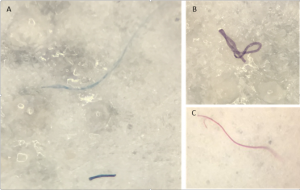 The plastics found in the tiny crustaceans were mostly microplastic fibers from our synthetic clothing, which are known for attracting PCBs and other toxic chemicals that like to cling to them. While microplastics may seem too tiny to have an impact, one team of researchers found that turtles become 20% more likely to die after consuming a single piece of plastic, and many beached whales have been found with guts full of plastic. “If we could magically snap our fingers over 10, 20, 50 years time and stop making plastic, what would happen to the plastic in the river? It would flush and wash out,” Jamieson told National Geographic.